These Easter egg ideas may seem a bit unusual, for decorating your Easter eggs. Naturally Colored by some Buff Orpington hens! There's no comparison with the intricate, delicate artwork of eggs done, for example, in many orthodox churches. Nor with the intricate, delicate egg shell carving that's also an art all by itself. No, this is much simpler stuff, with a traditional make-do feel, and a bit of originality. 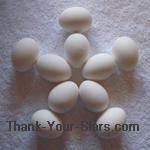 To begin with, chicken eggs are usually white or different shades of brown. Easter Eggs that will be eaten are usually hard-boiled first, and then cooled, before coloring them. Once the eggs are cooled, then the fun begins. What I used was black raspberry juice. 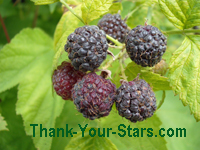 Black raspberries can be picked in the wild, bought, or grown in the garden in many areas. I first froze the black raspberries. Then I thawed them, and squeezed the juice out of them. Freezing and thawing seems to get more juice out of the berries. The black raspberry juice is a very dark juice that can stain easily. In fact, it was used for years in the meat industry when inspectors would stamp the meat with an edible stamp. Be aware that the juice can stain your fingers and hands, and can take some time for it to wear off. since this site deals with stars. Isn't it fun to be a child again? ... sometimes ! Tools of the Trade ! So now it's time to put some creativity to work. I put some thawed-out pure black raspberry juice in a small glass bowl. I took a clean wooden toothpick, dip it in the juice, and use it like a pencil to draw. You can also take Q-tip cotton swabs, and many other things to make different designs. You can put faces, crosses, names, squiggly lines, zig-zags, stars, and more. I made simple stars of different sizes just by 5 lines starting all at the same point. You can even take some of the eggs and dip them partially or all the way in the black raspberry juice. You can get a lighter color by wiping the juice off sooner with a paper towel. Or let dry longer, and then wipe for a bit darker color. With the juice from the black raspberries, it's possible to color your eggs from shades of light pink to red to very dark purple. Then give the eggs a little time to dry. 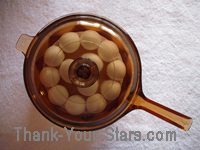 After the eggs are dried, you may want to display them in a nice Easter basket. To see what I did, there's more photos and ideas for a really unique Easter basket. It's kind of sad to have to eat your artwork. Either you spoil your artwork, or eventually the eggs are going to spoil! 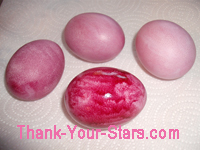 When you peel your eggs, you may find out how strong the black raspberry juice dye is. It may go through the shell and stain the egg itself! It's nice knowing that black raspberry juice is edible. Why do we Decorate Easter Eggs? In many cultures, churches and countries, there was - and still is - a custom of not eating any eggs during Lent, the 40 days of penance before Easter. So when Easter arrived, people were looking forward to eating eggs again. 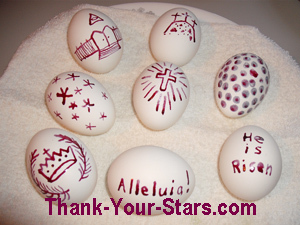 We decorate eggs to honor and celebrate how Jesus died to save us, and rose from the dead, to show that one day we also will rise forever to glory in heaven or shame in hell. Read more about this story in the Easter Bible Lessons and Stories. So the Easter egg is a symbol of Jesus rising from the dead. There was an earthquake, and the stone door of the tomb rolled away. The shell is like the tomb. You crack it to get to the white inside, a symbol of Jesus' glorified, shining bright body. And inside of that is the yellow yolk, a symbol that God is in Jesus, because Jesus is God, shining brighter than the sun. God sent a little blessing on Easter to our farm the first year the chickens were laying eggs. 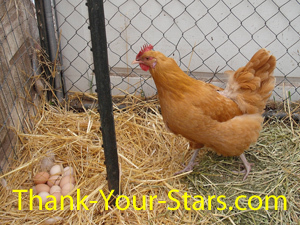 For several years, I raised only Buff Orpington chickens. They're a gentle breed that lays nice big eggs in various shades of tan to light brown, even during the winter. I no longer raise them. It was hard giving them up. I sometimes cried if I lost one - because they helped keep me alive the last winter I had them, as the egg money helped buy food and medicine. That first year, I had l0 laying hens in the flock. 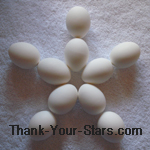 Now, a laying Buff Orpington hen will lay 3-5 eggs a week, because the eggs are quite large. 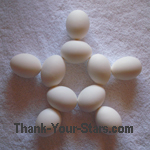 So it was very rare that all 10 of my hens laid an egg on the same day. I got them as chicks in June 2008, and they started laying the first week of December. 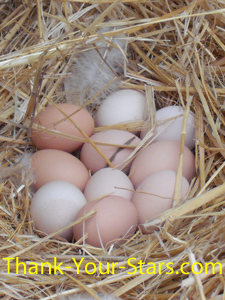 In the following Spring they all worked really hard - and laid a nest of 10 eggs - on Easter Sunday morning! found on Easter Sunday, April 12, 2009! Thank your stars for little miracles ! 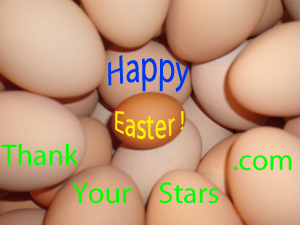 Go to Easter Poems and Traditions.